Duration: 42 min. per ep. Now Rurouni Kenshin is probably the best samurai manga story I have read to date, and I was pretty satisfied with the anime adaptation, so now I decided to check out the other anime versions, because I put it off for too long and to prep myself up for the recently announced new anime coming out in some time. I decided to watch the 2 episode ova that acts as sort of a closure to the series, and well... My mind is a little mixed up after watching this. To be fair, I did not personally think of this ova as a bad anime, in fact it's very good, aside from a bit of melodrama overdose (And I'm usually a big sucker for melodrama), the story does a great job at being a real tear jerker, and an emotional powerhouse that would have shaken me to my core if only it wasn't Rurouni Kenshin and was a different, original anime all together, I would've actually ended up loving it. I appreciated to finally see characters like Enishi in animated form along with some of the series greatest moments and battles, that was a great service to the fans, but... That's it, I couldn't enjoy it as anything other than that, why? Because, Himura Kenshin, the Hitokiri Battōsai, the famous fictional man slayer with a heart of gold, the Rurouni Kenshin himself, it really had nothing to do with him. What I saw was dying shell of a man, stricken with an unexplained disease, that was there to replace the Kenshin fans all know and love. Just what happened to the Kenshin who laughed and smile, where were the oros? No oro, just a soft spoken man that simply wants to die, just wandering around, trying to make everyone depressed, and is unfortunately successful at doing so. Out of character doesn't even begin to describe it, I honestly felt betrayed, and even cheated out of supposedly watching Kenshin in, no arguments about it, the best animation I've ever seen from Japan. But that's no compensation to me, and I doubt it was to the fans of the series as well, because what is the point of a series when the main character wasn't even actually present for the spotlight, if this was Durarara, it wouldn't matter, if this was Baccano, it still wouldn't matter, why? Because there's no actual main character in those series, all of the characters drove those series, but this is Rurouni Kenshin not those anime, and the titular character is the driving force of this particular story, it had everything to do with him, but in here, in this ova, it was just depressing that it actually had nothing to do with the actual kenshin I read about and cheered for in the manga. 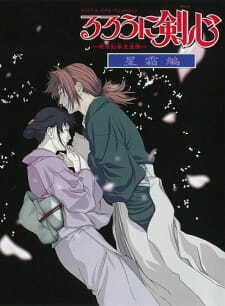 The series was a shonen romance swordsman story, not a freaking death of a samurai who spread his depression like a disease, like the disease this kenshin had himself, striping away every sense of humor the series had and everything it make people love about it, but only looked like the series it was trying to be. In another view point, this would've felt like another dragonball gt waiting to happen, but the difference here is that this was an actual well executed sad story and not a cash grab mockery of a franchise everyone loves, especially when it comes to the production values. I do not hate this ova, far from it, it's an amazing piece of animation that is practicably professional at making anyone depressed as they watch, I just completely disapprove of what I watched, and warn others who call themselves Rurouni Kenshin fans to not actually watch this, as I felt like it was a total alienation of the fans, but to everyone else, it's a great tragic story that has nothing to do with the actual story it was based off of, but definitely not the most recommended way to make more fans of the series. OVERALL: To sum it all up, to me: This ova was like a funeral for a beloved character, that was still actually walking around and wasn't even in his coffin in the first place, and with all the BS the character Kenshin went through, he deserved to have a happy ending or at least a better ending, not this. The Last arc of Rurouni Kenshin, it's all about the final days of a great man that is Kenshin. Everything has been decipted well in this OVA, from the stunning sceneries and up to the stunning orchestral score that it has. The story is delivered very well. It contains flashback of some of Kenshin's greatest battles and is remade or should I call it &quot;Remastered&quot;, with a stunning animation. It also includes some scenes/events which you won't find in the manga. The OVA itself will give you a timeslip of what has happened to Kenshin through all of the years he has spent during his swordsman days. If you have seen the TV Anime, Rurouni Kenshin. This OVA is highly recommended and should I say that you &quot;must&quot; also see the OVA masterpiece Rurouni Kenshin: Tsuioku Hen for these are the best OVA's of our time. ***Please do not read this if you have not seen this and/or do not like spoilers*** Thank you. So what's my beef with the third Samurai X OVA? Well, for starters, it's never a real positive when the creator is not involved with development of a new story (with George Lucas as the exception, as exemplified by the SW prequels). Also, I know people praise the animation as being far superior to the TV series, Rurouni Kenshin, but I wasn't a big fan of the new character designs. I'm all for high-quality, better action, more violence when appropriate, but don't strip the characters of the cool looks that made them unique. I am very grateful for the OVA having animations of the parts of the manga that were never realized by the show (to which it COULD have been done if the third series followed the manga, versus coming in with some totally random and meaningless storylines - but that's a whole 'nother rant I could get into...) especially the Enishi battle, but that too had a lot of problems. And here we go! Short of death, productions should NEVER try to substitute their actors - EVER. Hearing all of the original cast can't begin to express my pleasure at knowing production did their job. I loved seeing Kenshin and Kaoru actually touching hands, sharing a kiss, and simply taking the time to stand next to one another while looking out across the horizon, etc. It was a real treat seeing previous situations brought to life again, such as Kenshin's fight with Jineh, the montage of battles with Sojiro and Shishio, and including important figures like Hiko Seijuro, Shinomori Aoshi, and Saito Hajime. Yukishiro Enishi brought to life! The Jinchu arc of the RuroKen manga is my favorite, by far, because it is the most personal story of Kenshin's and the one in which Kaoru is spotlighted as his great love. So seeing Enishi moving and talking and fighting was a huge deal for me, even if the moment only lasted some minutes. As stated, I did not like the character designs for the OVAs. Hey, I'm all for the realism and a new look, but can't we make Kenshin still look "sharp" and Kaoru prettier? Even Tomoe looked really generic and beyond hairstyles, the two ladies could be interchangeable. BORING. And something in the way about Kenshin made him less attractive - as Kenshin or even as any anime character. M.I.A. - Saito and Aoshi!! WTF! We get one glance from Saito in the dojo flashback and you spend all this time on the Jineh fight, but you don't bother to animate ANY of the battle between Saito and Kenshin?! This battle could have been done in a montage fashion without any dialogue, but where is the Gatotsu! And then we get a faraway image of Aoshi when he, Sano, and Kenshin return from Shishio's lair - again, NO Aoshi interaction AT ALL! And hello! Where was Misao! I realize people may not like her, but I liked the fact she loved Aoshi and didn't have feelings for Kenshin. I understood that some of the events were changed from how things transpired from the manga or even the TV series, when recollected in the OVA, but some things altered so much, I find it unforgivable. Yes, you can skip the faked death doll as that would be too long and confusing to get into, so I was fine with Enishi straight-kidnapping Kaoru. I even enjoyed the fact they kept in the little exchange of understanding that Kaoru had for Enishi's pain in losing his beloved sister. But what about the final Enishi vs. Kenshin battle!?! There is no real reason to change the entire events of the Enishi vs. Kenshin battle on the island. Here was the perfect opportunity to show the fans all the major characters in RuroKen even if they never speak or are shown battling the "Four Gods" from the manga. I loved this part where Kenshin allows his comrades to shine in their respective artform in battle - Saito/katana; Aoshi/kodachis & martial arts; Yahiko/shinai; Sano/fists. Instead, Kenshin arrives alone - not even Yahiko and Sano are allowed. What a complete waste. And then, they completely altered the concept of the "truth" that Kenshin had found within his heart that brought him out of the self-imposed living hell he fell into once he thought he'd lost Kaoru. That truth was that no matter what, Kenshin would always pick up his sword to help someone in need - that is his way to find atonement for his past, and to carry on the sacrifice Tomoe made for him to live on. So WHY the hell would Kenshin offer up his life to Enishi? He is completely tossing aside the truth he found for the sake of one person when his goal was to save as many because dying is too easy - living is what is hard. They could have bypassed the gun fight problem by still letting Kaoru stand between Enishi and Kenshin at some point, but to have Kenshin not only fall to the ground to offer his life up, but to lie there and not even react when Kaoru fell over him to protect him from Enishi's sword? Wrong, wrong, wrong! The major problem here is that not involving Watsuki in the creative/development department meant missing his desire for Kenshin, as evidenced by the open-ended but happy place Kenshin and Kaoru found themselves at the end of the manga. Watsuki's own feelings about the OVA ending was that, "Kenshin went through so much crap and deserved a happy ending." And what did these OVA people do instead? - Kenshin decides to help his country by assisting those devasted by war and disease throughout Japan, so he leaves behind his son, Kenji, and his wife, Kaoru, for weeks upon weeks. - Finally, Kenshin using his last bits of energy returns home to Tokyo to at least die in Kaoru's arms, to which only then his cross-shaped scar finally disappears because he has found his peace and happiness in death. And based on Kaoru's health, she is soon to follow Kenshin aka Shinta to the grave. WHAT THE F*CK people! What upsets me about this ending is how far from the truth of Kenshin's character this OVA Kenshin has proven to be. For instance, at the manga's end, his truth is to stay alive and protect the helpless. However, in the end, Kenshin has found some peace by starting a quiet life with family. He evens gives up the sakabato as a symbol of having moved on past the concept of living and dying by the sword. I found Kenshin's desire to help the sick and destitute while he himself is sick and forsaking responsibilities to his own kin as being incredibly selfish and narcissistic. WHY? Because, the idea that one man, who has already done so much would continue to try and save the world, is a man who is acting as a martyr - even acting like God. He should let the era continue on. He should not try to affect the outcome for every generation. That is egotisical. He is supposed to help those he sees in front of him, not the memories of his past, etc., as expressed in the Jinchu arc. But that is all thrown out. **huff, huff, huff** ... OK. I'm calming down now. But there really was no need to let us see Kenshin die, let alone in such a pitiful and painful way, after "all the crap" he went through. We don't need to be given any kind of "realism" for a beloved character. There's nothing wrong with "happily ever after." There's a reason Cinderella and Prince Charming ends with the wedding and a kiss. We don't need to find out that 10 years later, they have a kid and marital problems, whether that be the truth or not, you know? Give us our joys. I gotta stop ranting - I'm getting annoyed and losing focus. Plus I'm tired and cranky and there is still work tomorrow morning. Basically, I totally dismiss Reflections from the official RuroKen canon and will adhere to the manga as Kenshin's true ending. Naturally, this is all my own personal ranting opinions, so it is what it is. Seisouhen is a feast for the senses. Sound and sightwise, nothing much else can compare to it. The art is crisp and beautiful and the sound track is superb. However, for story and characterization, it is simply terrible. Seisouhen attempts to compress the ten volume Jinchuu Arc into an hour and a half. It horribly butchers the characters and makes them do things they would never have done in the canon story. It reduces Enishi from a brilliant protagonist to one dimensional psychopath who swoops in and kidnaps Kaoru in order to bate Kenshin to fight. He is basically a second Udo Jinei. Sanosuke, Megumi, Yahiko, Aoshi, Misao and Saitou play no part in Kaoru's rescue. It is simply Kenshin vs Enishi. At the end of the fight, Kenshin does something so OOC that we know it must not really be he. In the end, Kaoru saves Kenshin from Enishi's judgment, Enishi leaves and that's it. After the adventure, Kenshin and Kaoru marry and have Kenji. Kenshin's body starts to give out on him, so he passes the Sakabatou to Yahiko. After doing this, Kenshin becomes very absorbed in his quest for atonement and makes a decision that will tear his family apart. Everyone in this story is OOC, that readers of the manga will wonder if this OVA is even based on the manga at all. To me, it just isn't worth seeing except for the glimpses of Kenji as a teenager.